This evening I got into my bag of scraps(and they were small pieces) cut a bazillion 2" squares and made random checkerboards 9" x 15" After I add a 1 and 1/2" border all around, (and quilt and bind) I will have four placemats. The borders and backing were trimmed from my Christmas Infinity quilt, so are all using up stash. I think I will give them to my daughter, if she likes them. Weds) A few weeks ago, while rearranging some fabric, I found two pkgs of fusible fleece. I have no idea when/where/why I bought them, but not recently. I used them to back my placemats, and they worked like a dream. Now all four are pressed, batted, backed, pinned, and some of the binding is cut. 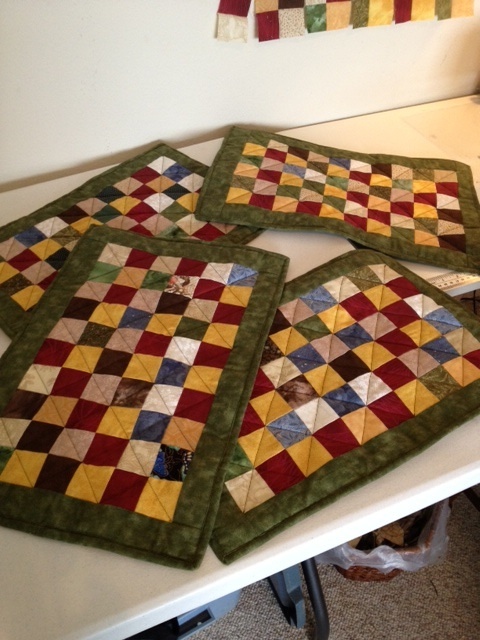 One of them is bound and quilted, and very nice. I did a diagonal grid in the pieced blocks, and had no problem going thru the intersections, and no missed stitches. I am pleased.